My husband and I used to be a perfect match. I emphasis “used to”, things have sadly changed. When we first met whenever we had a roast chicken he would always want the dark meat and me the white. I would sit there with a little smirk on my face thinking I had definitely without a doubt got the better deal and couldn’t quite understand why he wanted the dark meat and the chicken wings. Was he just being polite? We had only just started dating so this is a possibility. Had he fried his tastebuds from all that chilli he had eaten over the years (yup, he has his name up on the Hall of Flame in a chilli store in New Orleans for his chilli eating efforts)? No, he genuinely liked the dark meat so I didn’t need to feel guilty for getting the better deal I could just sit back and enjoy this perfect chicken eating relationship, or so I thought. They say 1 in 3 relationships end in divorce, well this chicken eating relationship suffered the similar fate. Now I would love to lay blame on my darling husband and say it is his fault, but I think in this case the blame is all on me or I could just say that it’s a woman’s prerogative to change her mind right? Well now without a doubt I prefer the dark more flavoursome meat and wings. What happened? Now that I’m in my mid thirties (that’s scary to see written in black and white) I think I am turning into my mum all the evidence suggests this: love of liquorice, fondness for porcelain china and of course preferring the dark meat over the white. Anyway, now when we have a roast chicken at home there are some dark looks that go along with the dark meat. What’s the secret to a happy chicken eating relationship? Wings my friends. Our family (and I’m pretty sure most people on the planet) can’t get enough of these delicious, crispy sticky snacks and everyone wins because everyone is getting the dark meat. There’s a reason restaurants do all you can eat wings. We normally eat them really hot and spicy with the good old favourite of hot sauce and butter….mmmmm…but then I discovered sticky wings. Mmmmmmm. 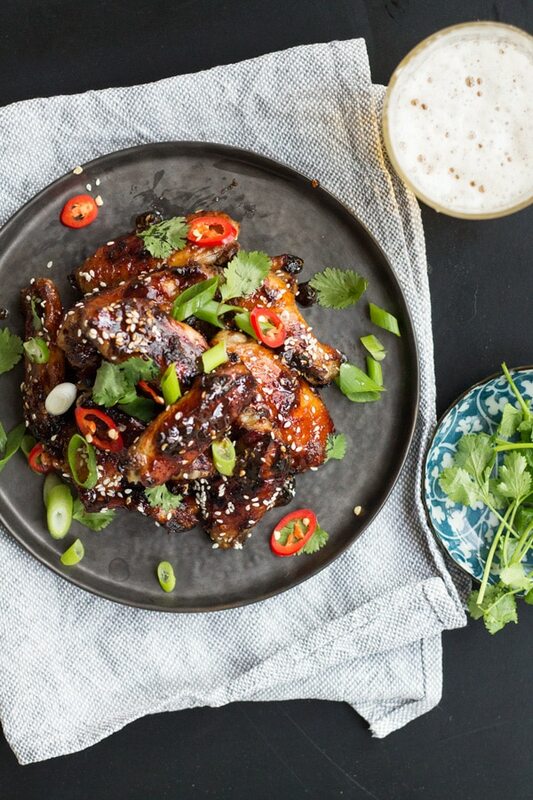 My Sticky Soy Glazed Chicken Wings are sticky, salty, spicy, crunchy and gooey all at the same time. 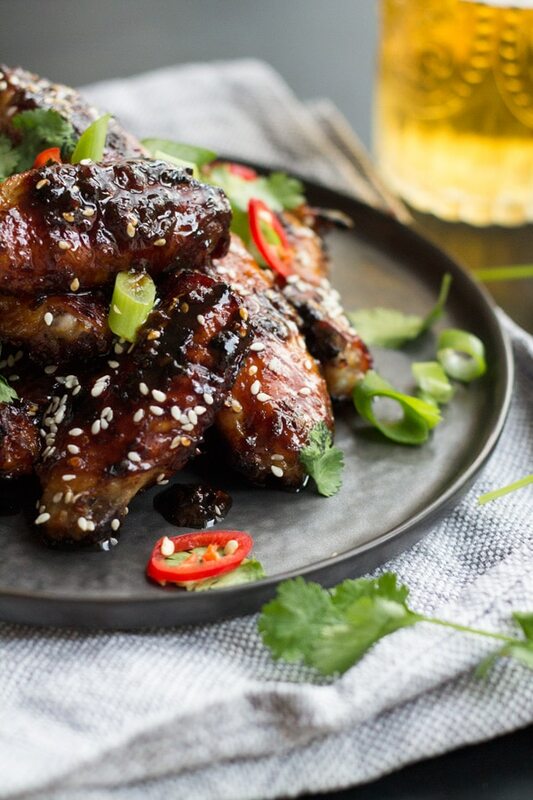 They’re super easy to make and, not that you’re thinking about calories when you’re eating wings, are in fact slightly healthier than butter laden hot wings. These are the perfect match alongside your favourite ice cold beer and I guarantee once you start eating them you’ll always have room for just one more of these snacks. The Sticky Soy Glazed Chicken Wings are quick to prep in under 10 minutes and although you might look at the glaze at first and think it’s far too runny once the wings have had 30-40 minutes baking in the oven (making sure you turn them and baste every 10 minutes) you’ll be left with delicious caramelised, sticky chicken wings. 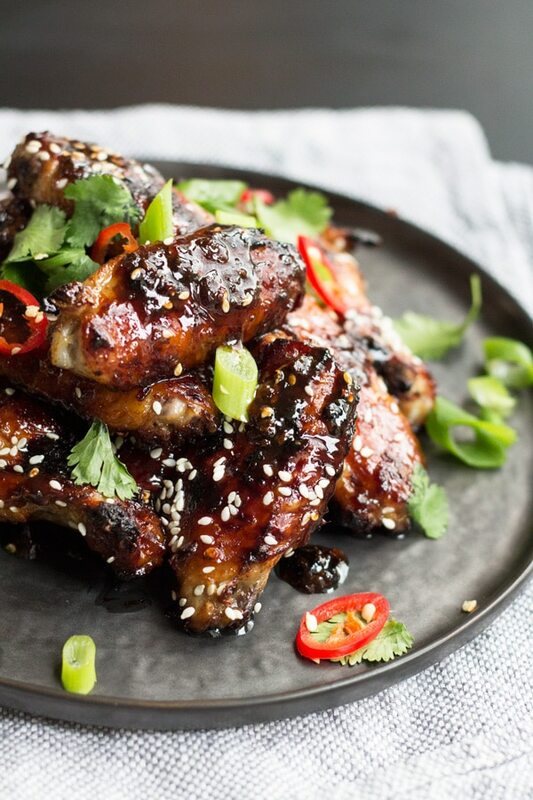 So here’s to making Sticky Soy Glazed Chicken Wings and happy chicken eating relationships everywhere! Preheat oven to 200C/390F. Line a baking tray with baking (parchment) paper. In a small bowl combine soy sauce, mirin, honey (see note 2), ginger, garlic and vinegar. 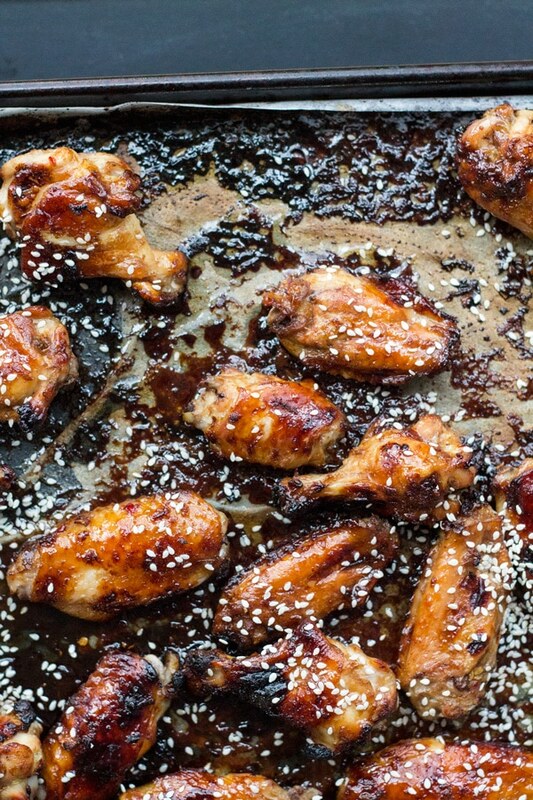 Place chicken wings in a large bowl, pour over glaze and toss until all the wings are coated. Transfer chicken wings to baking tray and arrange in a single layer. The glaze will look very runny at this stage but it will thicken and become sticky as it bakes. Bake for 30-40 minutes turning and basting the chicken every 10 minutes to ensure the chicken is coated in the glaze and to ensure it doesn’t burn. 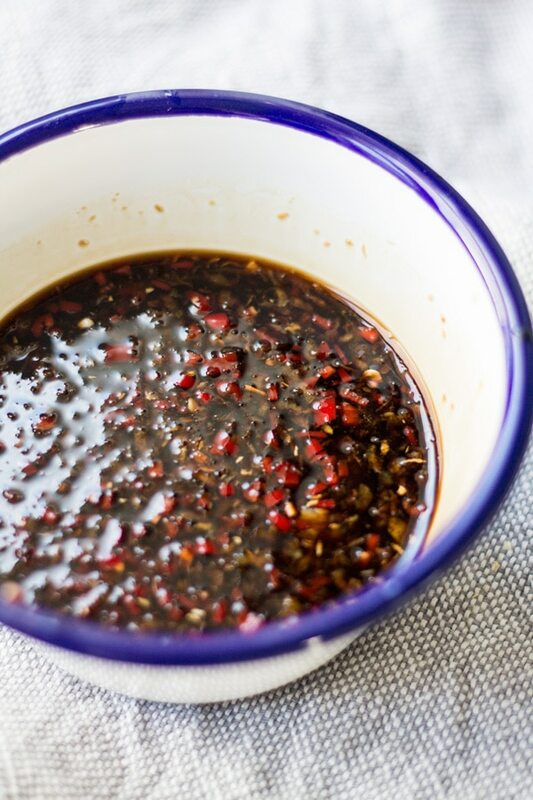 Scatter over sesame seeds, spring onion and coriander and serve immediately with an ice cold beer. 1. Mirin is a Japanese sugary rice wine similar to sake. I used the shio mirin which has less than 1.5% alcohol and is burned off during cooking. You can easily find this at your local supermarket in the international foods section. If you can’t find mirin then substitute with 1/4 cup white wine, dry vermouth or dry sherry and 1 Tbsp caster sugar. 2. If it’s cold then you may need to heat your honey slightly in the microwave or over the stove so that it is runny enough to easily mix with the rest of the glaze. 3. For gluten free replace soy with tamari. If you make this, I would love to see! Tag your photo with #mylittlelarder on Instagram. Wow these look delicious! Thanks for sharing. Thank you so much Chris! Soy glazed is always good, actually anything glazed is good in my books! Hope you enjoy them.